HENRY COUNTY, GA (CBS46) — The disturbing video of former NFL player Desmond Marrow being violently arrested by Henry County officers has reverberated across the country. He’s seen on video being knocked to the ground by a Henry County officer and choked. That officer was later fired after video surfaced of the incident. “The video wasn’t released until April and so there are some questions about why it took so long for that to be known--for the public to hear about it. 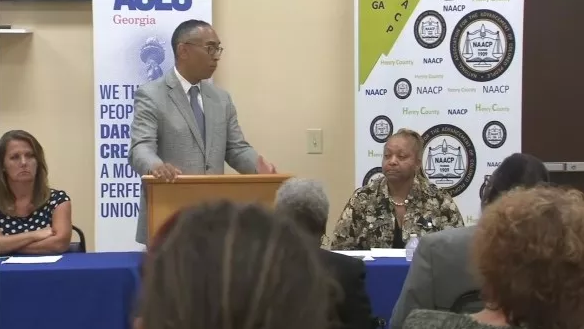 What the use of force practices are, specific to Henry County,” stated ACLU of Georgia political director, Burrell Ellis. “The firing of the officer was the right first step to take, but beyond that how do we know that these types of incidences and violent arrests won’t continue to happen targeting African Americans, young black men?” Ellis said. As dozens of Henry County residents filed into the town hall and panel Thursday night at Mt. Olive Baptist Church in Stockbridge, attention quickly turned to the leaders who were noticably absent: Police Chief Mark Amerman and all county commissioners. “Henry County and a lot of counties are late having this discussion,” said panelist Gerald Gigs, an attorney representing Desmond Marrow. “This discussion started with Trayvon Martin. This discussion started with Michael Brown. This conversation should have started with Philando Castile, Alton Sterling…The fact that there is not one county commissioner here tonight is a problem,” Griggs added. “I think the local police have done a great job in terms of dialogue, but tonight would’ve been a great night for them to be here,” said Terrance Gattis, the pastor of Mt. Olive Baptist Church and chaplain for the City of Stockbridge. “I understand that they’re not here because of some pending litigation. With that being said, I’ll take them at their word for now. With that being said I think we need to do more to have dialogue,” he added.